Posted by OromianEconomist in Africa, Humanity and Social Civilization, Kemetic Ancient African Culture, Waaqeffanna (Oromo ancient African Faith System). 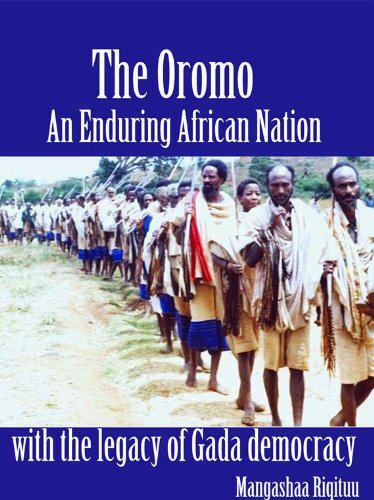 Posted by OromianEconomist in 10 best Youtube videos, Africa, African Beat, African Literature, Culture, Mammaaksa Oromoo, Oromo Culture, Qaallu Institution, Safuu: the Oromo moral value and doctrine, Seera Yaayyaa Shananii, The Oromo Theory of Knowledge, Waaqeffanna (Oromo ancient African Faith System). Waaqa garaa gurraachaa, tokkicha maqaa dhibbaa jechuun abbootii fi haadholii keenya taranii fi jiran gidduutti beekamaadha. Garuu Oromoon keenya heedduun baroottan dhihoon asitti ‘Waaqa garaa gurraachaa’ jecha jedhu lagatee akka Waaqa tolfamaatti utuu abaaruu nidhageenya. Kanaafuu ‘Waaqa garaa gurraachaa’ keessatti ‘garaa gurraachaa’ kan jedhu eenyummaa Waaqayyoo kan ibsuudha malee Waaqa tolfamaa miti. Tokkicha maqaa dhibbaa akkamittan sihinbeeku? Posted by OromianEconomist in Africa, African Literature, Ancient African Direct Democracy, Ancient Egyptian, Ancient Rock paintings in Oromia, Ateetee, Ateetee (Siiqqee Institution), Black History, Chiekh Anta Diop, Culture, Cushtic, Humanity and Social Civilization, Irreecha, Irreecha (Irreesa) 2014, Irreecha (Irreessa) 2014, Irreecha Birraa, Kemetic Ancient African Culture, Meroetic Oromo, Oromia, Oromiyaa, Oromo, Oromo Culture, Oromo Identity, Oromo Nation, Oromo Social System, Oromo Wisdom, Oromummaa, Qaallu Institution, The Goddess of Fecundity, Waaqeffanna (Oromo ancient African Faith System). 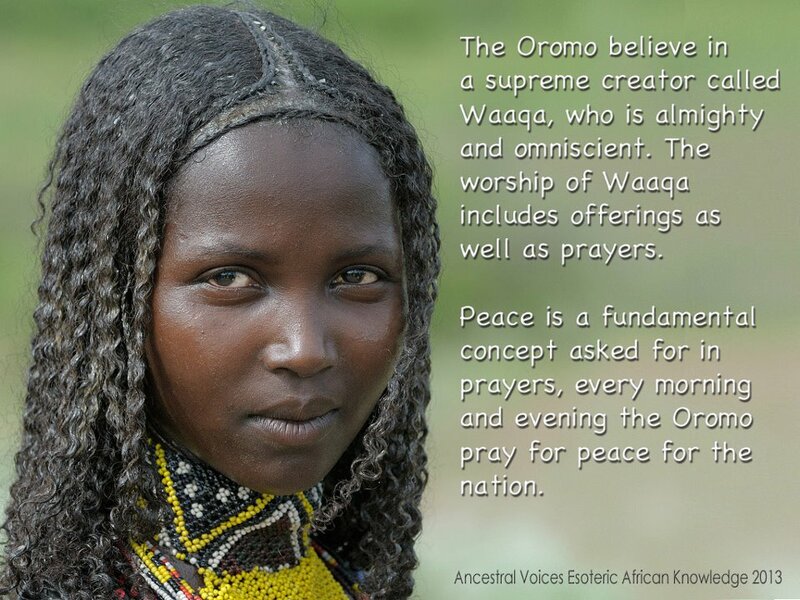 I will focus on the case of Waaqeffannaa, an Oromo indigenous religion of East Africa, and its core values and laws. It will be significant to examine Waaqeffannaa’s complex concepts, such as concept and view of Waaqaa (God), Eebba (prayers and blessings), safuu (the place of all things and beings in the cosmic and social order), issues related to cubbuu (sin) and other religious and ritual practices. Although there is no holy book forWaaqeffannaa thus far, I will obtain my data from published ethnographic books, journal articles, periodicals, relevant reports and press releases. The interactions between Waaqeffannaa and other organized religions, such as Christianity and Islam, will be examined in context. They acknowledge three places destined to receive the souls after death. The paradise, which they call: the ‘Happiness of God’,Ayyaana Waaqaa; or the: ‘Response of God’, Bayanacha Waaqaa; or even Jenneta Waaqaa; ‘Paradise of God’, is reserved for the just who go there to enjoy the company and infinite blessings of the Lord … they say of death ‘That he passed on to Waaqaa;’ – ‘That he entered into Waaqaa,’ – ‘That he went to his eternal house with Waaqaa’. Waaqeffannaa rituals honor both God and the earth. Followers of the religion seem to take cue from God Himself, who created the earth, to inform their ways of relating to Waaqaa and earth (lafa). Evidence that suggests a relationship based on fears, intimidations or punishment between God and persons is less prevalent than those that are mostly based on respect for God, one another and for the earth. Waaqeffataas embrace and celebrate the egalitarian view of God and the diversity of names people call God. Despite some differences among people, research points to followers’ similar attitudes towards God. “… it has become clear that their attitude towards him [sic] is not only inspired by awe but also marked by familiarity and even, from time to time, by lack of respect. In his despair, a man may claim: ‘Waaqaa does not exist!’” This just showsWaaqeffataas have a more liberal relationship with God. It does not mean that they are less pious as there is enough evidence to suggest many magnificent examples of humility, piety and obedience. The question of Waaqeffataas’ acknowledgement of the oneness of God and the multiple names various religions call Him does not only show the openness of the concept of God to various interpretations, but it also shows the religion’s acceptance of religious diversity. It is easier to engage in interfaith or other conflict resolution activities when such an acknowledgement is extant than when religions claim “my way or the highway.” The ways some prayers are rendered testify to this progressive values of Waaqeffannaa: “O Black God who created the dark sky and the clean waters, who is one but called by multitudes of names, who has no competitor, the omniscient, the omnipotent, the omnipresent, who is eternal and ever powerful, whose power can never decline.” Because of the view of God described here, Waaqeffataas believe that God is patient and that it is not in His nature to become angry if people believe in other things abandoning Him. Bokku holds the Waaqeffannaa God is too self-confident to be angered into punishing people who do not obey or defect to other religions. It is accurate that Waaqeffannaa and similar Africa indigenous religions are being reincarnated and are slowly starting to become explicitly important in the lives of so many people. Religious traditions, including those from indigenous religions, form the bedrock of the values of those Africans who converted to Christianity and Islam. Often these values moderate the foreign values associated with the cultures from which these major religions originated. It is not just the Waaqeffataas who only follow the indigenous religion, but a swathe peoples seem to have accepted double or triple religious lives. They shuttle between various religious and cultural values in their daily decision-makings so as to adapt to changing socio-economic circumstances. Pointing to the loose nature of individual’s and group’s negotiations between multiple religious identities, Aguilar presents a case of the importance of “religious diversification for survival” among the Kenyan Boran/Oromo in northern Kenya. Aguilar provides the best illustration for survival and adaptation by accepting diverse religious values. He cites how Muslim and Waaqeffaannaa parents send their children to Catholic schools in northern Kenya and that the children do perfectly well shuttling between religious worldviews without facing physical dangers. The same religious rituals performed by followers of Waaqeffannaa form the cores of the rituals and daily cultural practices of the followers of Islam and Christianity, as a mechanism of preserving and transmitting their identity. For instance, some of the religious traditions and rituals kept by Oromo communities who converted to major religions in north Kenya include similar types of blessings, prayers, and peacemaking through rituals of coffee beans-slaughtering and symbolic prayers. These subtle practices of syncretism not only form the core identity of Oromo in north Kenya and connect them to the mainland (Oromia-Ethiopia), but they also play stabilizing roles in a families and communities there. Another leading expert on Waaqeffannaa, Bokku quotes Bartels directly and extends the concept of Safuu to broad areas of “morality”, “norm” and “laws” that govern social and ecological order. Bokku states his extended definition building on Bartels: “Safuu is the understanding of differences and appreciation of differences for the peaceful coexistence of all natural things.” For Bokkuu, as opposed to man-made laws “safuu is not subject to change.” He concludes that safuu as laws of nature is necessary for the “smooth operation of life”, which is harmony. Everyone invokes the notions that Safuu owes its authority over social relationship because it derives from the will or the spirit of God (ayyaanaa). 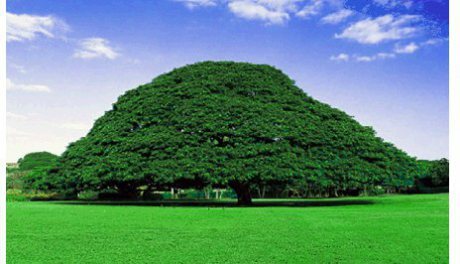 Thus, experts agree that Safuuis one of the fundamental principles of Oromo culture that governs relationships and keeps society together. In Waaqeffannaa, destroying (for example killing humans in conflict) is prohibited by the religion’s laws. Those who violate traditional laws and destroy anything will face alienation and banning from God as well as from fellows humans. They are denied opportunities to sit and eat at a table with family members and others; they become social outcasts. My evidence does not suggest any anti-social principles/laws in the Waaqeffannaaworldview so far. Even some of the curses that are put on people have the goal of ensuring social harmony and can be viewed positively. If I had come across anything that says, “if you kill your enemy or someone, God will reward you with heaven or sainthood or some other rewards,” I would have paused and thought, this is a justification for war and destruction that needs to be hermetically transformed. Transformation may be due if violence is made into something sacred. In my opinion the values of this religion particularly those about safuu are poised to play important peacebuilding and relationship-building roles at least in Ethiopia and the Horn of Africa. About the locus of the existence of African religions, Mbiti writes, “Religion in African societies is written not on paper but in people’s heart, minds, oral history, rituals, and religious personages like the priests, rainmakers, official elders … African religions have neither founders nor reformers.”Mbiti’s notion of the lack of founders and reformers can be contested because it could be that founders and reformers might have existed millennia ago and simply no written records were kept about them. The key point here is that words of mouth are dynamic. The best way to reach the hearts and minds of the vast peoples of rural Africa should be through oral traditions and spoken language. The prevalent practice by third party interveners shows an opposite tendency of bureaucratizing everything and transmitting messages via the written medium (forms and documents) through the agency of “rational professionals”. I deliberately tried not to impose a theoretical framework over my analysis although my approach was influenced by hermeneutics. Engaging in peacemaking in indigenous African communities requires the use of what Gopin, drawing on Lederach, calls “elicitive and cross-cultural methods.” Concepts such as safuu, the Waaqeffannaa worldview, prayers, blessings, harmony are predominantly about building relationships between people and people, and them and nature. The most effective way of arriving at these principles and using them in interventions is to do one’s best to involve indigenous peoples, religious leaders, elders and parties to conflict and to elicit from them the best practices they have evolved over centuries in peacemaking. Thirdly, African indigenous religions have not been given the places they deserve in some continental interfaith organizations whose member religions tend to be organized and rich major religions. For instances, the United Religious Initiative (URI) Africa chapter, an international faith network that operates in 25 African countries, professes that it aims to look for solutions to Africa’s challenges at community levels in the areas of corruption, human rights violation, poverty and HIV/AIDs, but unfortunately no indigenous African religious tradition from any community is represented by such an important organization. The network carries it activities in Africa through major faiths, such as Christianity and Islam. Another domestic (Ethiopian) interfaith network, Interfaith Peace-building Initiative (IPI), a member of the URI, has no indigenous Ethiopian religions (Waaqeffannaaincluded) as its members. I explored and discussed the ways in which the egalitarian but respectful views of God by Waaqeffataas can be helpful in curbing extremist tendencies. Neither oral scriptures of the religion nor its leaders condone acts of violence as something leading to rewards or sainthood. Prayers and blessings function as authoritative moderators and they can be used in opening and closing any intervention efforts. Waaqeffannaa is a very pragmatic religion whose most themes are linked to and earthbound to the material conditions of people. Therefore, people in conflict may have the same questions they want answered through prayers to be answered through interventions.